CRISPY, FRIED, CHEESE - FILLED WONTONS WITH A VARIETY OF FUN FLAVORS! 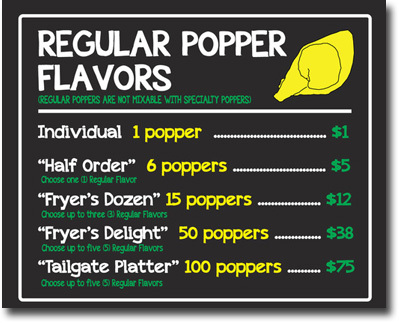 *** Please do not mix REGULAR popper flavors with SPECIALTY popper flavors. They are priced differently. 1. SPINACH AND ARTICHOKE : Spinach, Artichoke, Mozzarella, Creme Cheese and Parmesan VEG, TOP SELLER! 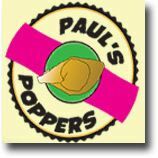 Paul's Poppers started like most small businesses ... as a small glimmer in the back of the mind of someone determined to make something really special. 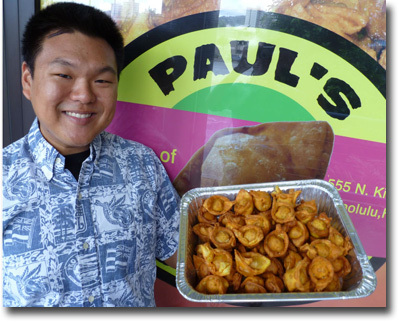 After finishing school, 27 year old Saint Louis Alumni, Paul Park was determined to bring his beloved Fried Pupu idea to life. 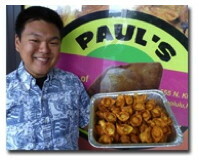 With the help of his friends and family, he eventually succeeded in fulfilling his dream and opened Paul's Poppers in April 2011. 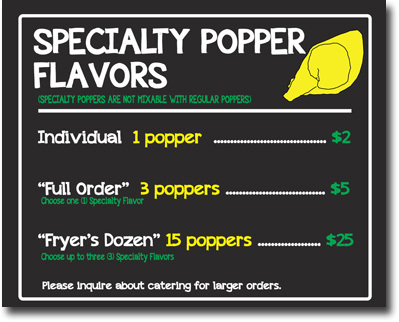 Today, Paul's Poppers makes over 25 different flavors of poppers! Visit our store in Kalihi to try our full menu including poppers and plate lunches. 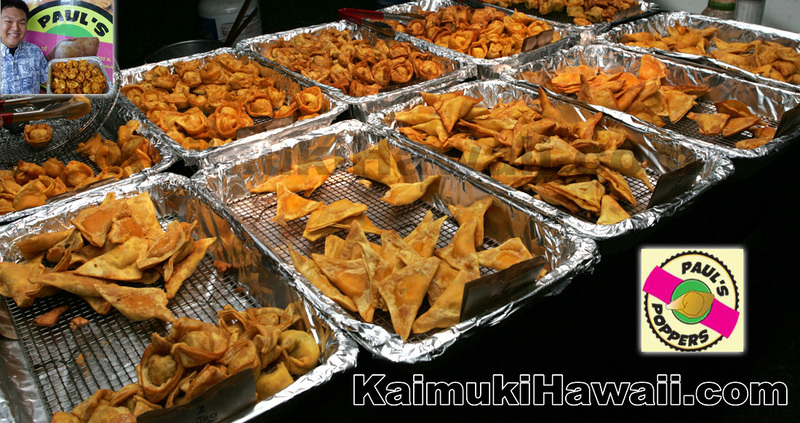 Find us at events such as Eat the Street and the Honolulu Night Market. Lastly, our poppers can also be found at THE SHACK MILILANI and HAWAII KAI and at KINGS KORNER! "Thank you for supporting local and don't forget to Share with Aloha! " Want PAUL'S POPPERS to be part our your next party? 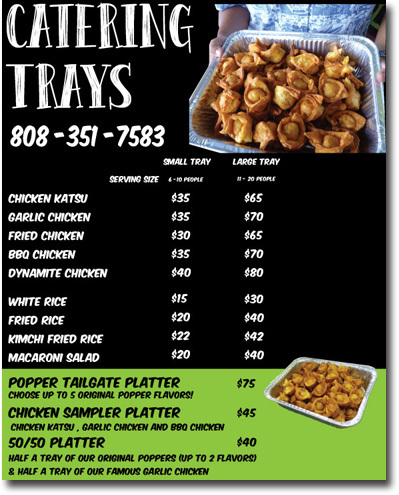 Our Kalihi Shop has many types of catering options, ranging from Pickup Party Platter Trays to School Fundraiser Events! Call today and find out ways to bring poppers to your nextget-together! 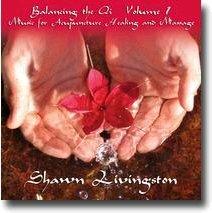 ***Consuming raw or undercooked foods may increase your risk of food- borne illness.